Beginning in the 1960s, contemporary Experimental Psychopathology (EP) is primarily devoted to laboratory research on the cognitive, affective, and motivational bases of mental disease by using behavioural, as well as psychophysiological and neurobiological paradigms. Therefore, EP aims at understanding what causes and maintains psychological distress by integrating knowledge and research methods from different domains. Guided by the assumption that mental diseases can be explained by the same processes that regulate normal behaviours, such a discipline aims to be a bridge between basic and applied research, providing useful knowledge to make clinical assessments and treatments more effective and scientifically-based. 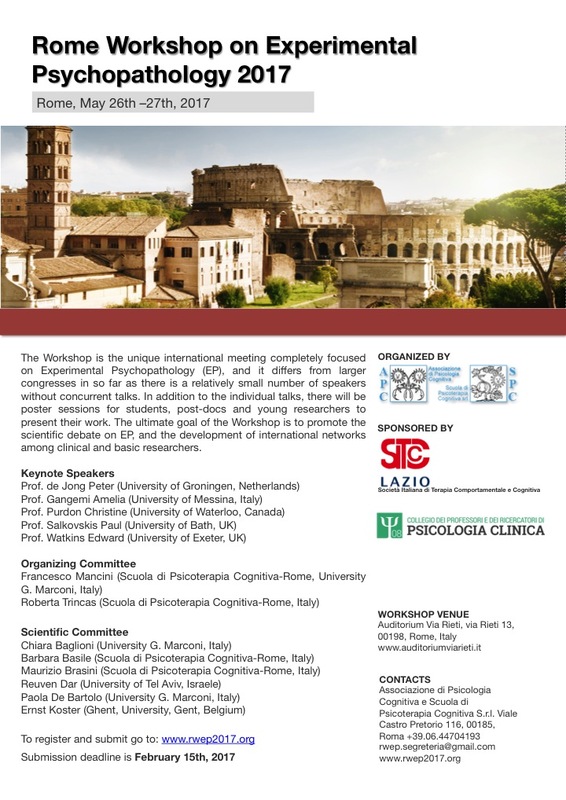 The Workshop is the unique international meeting completely focused on Experimental Psychopathology, and it differs from larger congresses in so far as there is a relatively small number of speakers without concurrent talks. In addition to the individual talks, there will be poster sessions for students, post-docs and young researchers to present their work. The ultimate goal of the Workshop is to promote the scientific debate on EP, and the development of international networks among clinical and basic researchers. The Workshop will run from May 26th to 27th 2017. Other details about keynote speakers will be available as soon as possible.